Image: Vosparee/Getty Images. Design: Ashley Britton/SheKnows. If you’re on the fence about breastfeeding your own baby, you’re not alone. SheKnows talked to experts about possible medical complications that might make you want to reconsider hopping onto the breastfeeding train. Just remember that whatever you do, it’s your choice as a parent — and yours alone. When you breastfeed, calcium can leach out of your bones, so you might not want to breastfeed — or at least not for very long — if you have lower bone density. “If you are at high risk of osteoporosis — such as you have a long history of anorexia/low BMI — then nursing for a prolonged time will keep your estrogen levels low and may cause your bone density to decline,” says Brodman. However, this is generally not a reason to avoid nursing totally unless the condition is very severe, she says. “Women are strongly encouraged to breastfeed, at least for six weeks, to give the baby immunologic protection against infection. So perhaps consider nursing for a few weeks or months and then stop,” she says. Of course you want to put your baby’s best interests first, so if you try various methods to increase your breast milk supply and it’s still really weak, you may want to stop nursing. And remember: That is absolutely not a “failure” on your part. “Some women try very hard to nurse, but they have really bad milk supply, the baby is hungry all the time and is irritable, the mother is absolutely exhausted, and the whole process is stressful to the mother and baby, and it’s just not working out for anyone,” says Brodman. If this is the case, it’s really a judgment call, and sometimes, the best answer is to supplement breast milk with formula instead, she says. Here, a lactation consultant would be helpful as well as a pediatrician or OB, she adds. If you’ve undergone a breast reduction, your milk supply might be compromised, says Brodman. “Breast-reduction surgery may prevent good milk supply and may make it impossible to nurse effectively. Women are encouraged to try. If milk supply is not good, then they can stop,” she says. Note that breast implants likely won’t cause the same problems. “Breast implants usually do not prevent nursing, especially if they are placed behind the chest muscles, but on occasion, any type of prior breast surgery may impede milk supply,” she says. And if you’ve had breast infections, like mastitis, you might also want to forgo breastfeeding, says Natalie Telyatnikov, a certified postpartum-support specialist and physician and the founder of?Better Postpartum. “Clogged ducts and resulting infections, like mastitis, may also cause some women to choose to forgo continued breastfeeding — although in this case, the best thing to resolve clogged ducts is to continue to move the milk, which?can?be facilitated using a breast pump,” she says. Unfortunately, it is possible to transmit the infection to your baby through breastfeeding, so it’s advised not to breastfeed if you have HIV — and to be very cautious if you have herpes, says Dr. Jennifer Landa, a gynecologist and chief medical officer at BodyLogicMD. Women with present herpes lesions can transmit herpes to their baby, which is dangerous for infants, she says. “If a mom has herpes on her breast, she should avoid breastfeeding and consider pumping and dumping instead, which will keep her milk supply available until her herpes lesions resolve,” she adds. However, you can breastfeed if there are no active lesions on the breasts. But HIV is a different story. It is not safe for HIV-positive mothers to breastfeed due to the concern about transmission to the infant regardless of the levels of the virus in the blood and the use of medications to keep it more dormant, Landa says. Unfortunately, there’s no getting around this one. “A mother’s mental and emotional well-being comes first. So if breastfeeding is too taxing or stressful and is making mom unhappy or unhealthy, that mother should feel supported in her choice to not breastfeed,” says Telyatnikov. In fact, Jen Schwartz, postpartum depression survivor and founder of Motherhood-Understood, understands how difficult it can be on the mother mentally after giving birth. “I wanted to and attempted to breastfeed, but by the second day home from the hospital I was hit smack in the face by postpartum depression and anxiety. I couldn’t breastfeed and take the medications I needed to help me feel better, and I also needed others to be able to give my baby a bottle so I could rest,” she tells SheKnows. 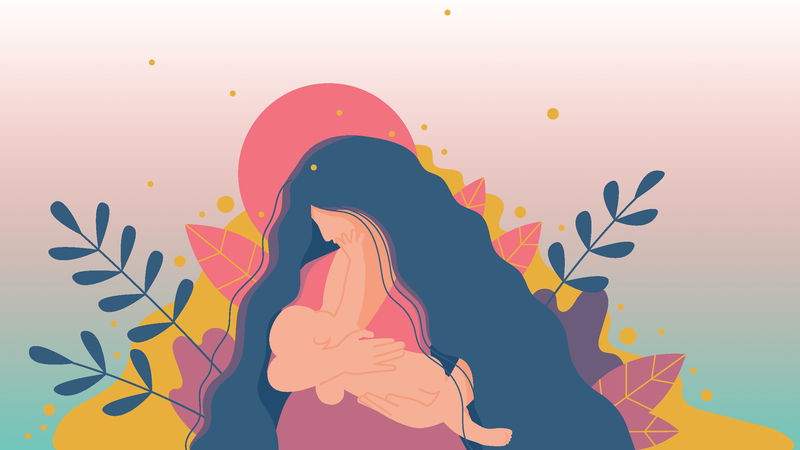 “I chose to take care of my mental health so I could eventually be well and present to take care of my son instead of breastfeeding,” she explains. This makes sense, as breastfeeding can worsen symptoms of those who have depression. “Some women with depression have worsening of depression due to lowered estrogen levels that occur with nursing,” Brodman explains. A psychiatrist can help if depression due to low estrogen is a concern or if there are medications being taken for depression that are Category D or X, both of which shouldn’t be taken while breastfeeding, as they can harm the baby, explains Brodman.